Embroidery Club is on Thursday, Dec. 1 a 5:30. This is a busy time of year for everyone. We are all busy with shopping and finishing those Christmas projects. This month in Embroidery Club we are going to use the Chic Travel Project CD to create a holiday gift bag that can be used after the gift is open. We are going to make the Shoe Bag which can be embroidered in the 5×7 hoop. This will be a fun project to inspire. 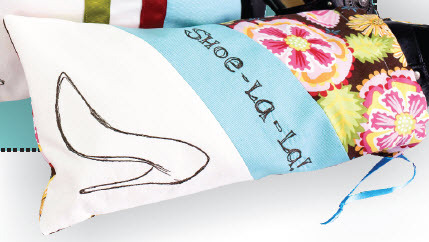 Why not pick some holiday fabrics for your “shoe bag.” You can use the shoe design included on the CD or bring your own designs. If you decide to bring your own designs try to pick one that is approximate 6 – 6 3/4″ x 1 – 1 1/2″ for lettering. The design replacement for the shoe 4 3/4″ x 6″ . The sizes are approximate and should fit in a 5×7 hoop. As long as the design you select fits in the 5×7 hoop, we can make it work for the project. Please note, the fee for Embroidery Club has changed it is now $10. This entry was posted in Classes, Embroidery Club on November 28, 2011 by Designs by Marje.